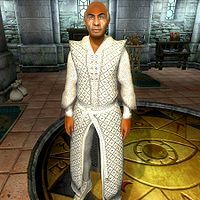 Delmar, a Redguard enchanter, is a Wizard of the Mages Guild and head of the enchanting services at the Arcane University. As you'll find out during the related quest, he specializes in creating Mage's Staves. He will spend most of his day (from waking up at 8am until midnight) wandering aimlessly around the Chironasium. He will pause between 2pm and 5pm to read a book that he selects from those available in the Enchanting center. While he is reading, he will not offer services. At midnight he will retire to sleep in one of the beds on the second floor of the building. During the related quest, after you have chosen which staff you want, he will be found wandering around all day, waiting for you to talk to him. Also, during the Light the Dragonfires quest, he and all other Imperial City citizens will remain indoors, due to the martial law established in the city. He wears upper-class attire consisting of white mage's robes and shoes. He also carries an Enchanter's key and a sizable amount of gold. He doesn't wield any weapons, relying instead on a set of leveled spells from all of the magical schools but Restoration. Delmar is recognized as the University's staff expert. Martina Floria will tell you: "Delmar handles all staff enchantments. You'll need to speak to him about it." Once you have the required wood, Raminus will send you off: "Now that you have the wood, speak with Delmar at the Chironasium." When you approach him, he will greet you simply: "Welcome to the Chironasium. Can I help you?" He finds the Imperial City captivating as you will hear should you ask him about it: "Enchanting city. A real eye-full. Just walk and gawk. Stroll along the Greenway and around the Palace." On the Mages Guild topic, he has the following to say: "If you're looking to create your own enchantments, you've come to the right place." When you ask him about creating your own staff, if you approach him without the wood for your staff, he will tell you, "I'm afraid there's little I can do to assist you, unless you have the wood we need to start. Bring me some wood, and we can get to work." When you bring him the wood he will inform you that this is a big thing for a Mage Apprentice: "Ah, yes! This is a big step for you, friend. Whether you know it or not. Now you'll need to decide what sort of staff you're looking for. Something that fits you, and your abilities. Shall we begin?" If you say no he will reply: "Very well. I'll be here when you're ready." When you are ready he will inform you: "Enchanting staves can be a tricky business. Only certain spells will be truly useful to you, so I'll narrow it down some. Which school appeals most to you - Destruction, Illusion or Mysticism?" He will then remove the Unfinished Staff from your inventory. If you choose Destruction he will comment: "Very well. You have three choices for what type of damage you'd like it to do: Fire, Frost, or Shock?" Selecting fire will yield this response: "You'll have a staff capable of creating fireballs. If that's what you want, I'll get started on it right away. Otherwise we can start over." If you select frost he will comment: "Your staff will give you power over ice. Is that what you want? If not, we can start over." If you pick shock: "Your staff will wield the power of lightning. If you want something else instead, we can start over." Any time you choose to start over he will say: "Oh, all right then. Your choices are Destruction, Illusion, or Mysticism. Which will it be?" If you instead would like Illusion he will tell you: "There are three options for Illusion magic. They are Charm, Paralyze, and Silence. Which would you like?" If you select charm: "With this, you can manipulate people's opinions of you. Is this what you want? If not, we can start over." If you choose paralyze: "You'll be able to freeze opponents in their tracks for a short time with this staff. I can begin work now, or we can start over." If you pick Silence: "With this staff, you'll render others incapable of using magic against you. If you'd prefer something else, we can start over." If Mysticism is the school you desire he will tell you: "There are three things I can enchant the staff with: Soul Trap, Telekinesis, and Dispel." If you select soul trap: "This staff will allow you to trap the souls of enemies you defeat, if you can do so before the effect wears off. Is this acceptable?" If you choose telekinesis: "The staff will allow you to manipulate objects normally out of your reach. A handy, and often amusing, spell. Is this what you'd like?" If you pick dispel: "This staff will allow you to nullify magic protecting your enemies. If you'd prefer another enchantment, we can start over." Once you have decided on a spell he will say: "Right, I'll get to work. You come see me tomorrow, and I'll have your staff ready." Speaking to him again will lead him to tell you: "I'm working on it. It'll be done soon." Once a day has elapsed he will be happy to inform you: "Yes, it's all finished. It's in that cupboard, back in the corner. I hope it serves you well!" Delmar's class is "MerchEnchanter", and therefore in the Construction Set merchant services are enabled (with 1200 barter gold). However, he will never barter with you and it is not possible to invest in his store. Therefore, he does not actually provide any merchant services during the game. The cupboard with the completed staff has a chance of containing scrolls as well as tomes if you have purchased the Spell Tomes official plug-in. Delmar never leaves the Chironasium, so there are three lines of unique dialogue that he can never say (they require him to be outside of the Chironasium). He was supposed to greet you for the first time with, "Enchanted to meet you. Delmar, Enchanter Extraordinaire to the Mages Guild! At your service. Got some enchanting in mind?" If you approach him about making your staff when outside the Chironasium, he would have said, "Come see me when I'm at the Chironasium, and we'll take care of that for you." Once he has finished your staff, he would have said, "Yes, it's all finished. It's in a cupboard, back at the Chironasium. I hope it serves you well!" This page was last modified on 26 December 2017, at 22:34.